Giro di Lombardia next Sunday and then that's just about it for the year on the road as track racing takes over for the winter. race report is expanding, so that seems like a good place to leave Ponferrada and the 2014 World Championships. Thanks for your company over the last couple of days. Let's do it again some time. British Cycling chief Sir Dave Brailsford told BBC Sport: "I thought Ben rode the perfect race and the team rode a lot better this year. Pete Kennaugh rode really well and Luke Rowe did a fantastic job. "Hats off to Kwiatkowski. The way he got his team to ride was brilliant and the way he rode away at the end. He was a class act." On Wiggins's gold medal, he added: "That's been a few years in the making so to see Brad get that title was fantastic. It's nice to be involved with anything that's got a Union Jack on it." As for Britain, it's been a mixed championships. Lizzie Armitstead was disappointed to finish seven in the women's road race on Saturday, but Ben Swift's 12th will be viewed in a more positive light. And let's not forget Sir Bradley Wiggins winning the individual time trial on Wednesday. It's been a decent week for Kwiatkowski, who adds the gold medal to the team time trial bronze he won with his professional team - Omega Pharma - Quick-Step - last Sunday. It was a clever move by Kwiatkowski who knew he would not be able to eke out enough seconds if he attacked on the final climb. By going early, he gave himself the opportunity to open up a large enough gap to see him home and the plan worked perfectly. Gerrans may well be kicking himself after letting Kwiatkowski go clear but a silver medal at a World Champs is not to be sniffed at. And spare a thought for poor old Alejandro Valverde. It will be the sixth time he gets to stand on the podium at the World Championships - but never on the top step. Three successive bronze medals, four in total, to add to two silvers. "Britain rode to a plan and executed it well. It was just unfortunate that the last 10 minutes were extremely difficult and Ben Swift ran out of his legs, but finished among other sprinters like him. Hats off to them. It wasn't just about coming to win the jersey it was about doing the jersey proud and they did that." Pete Kennaugh on BBC Two: "I'm happy with how I rode and to be in the mix as a team we did a really good ride. Twelfth is a good result for Ben. I tried my luck early on which was the gameplan, to follow the bigger nations. I gave it my best shot and once I got caught I tried to do the best I could for Swifty." And here is Ben Swift, talking on BBC Two: "Kwiatkowski is such a class act. He had his team on the front and he definitely deserved the win. "I gave it my best shot but that last steep climb really hurt. I got myself into a good position but it was just a hard day. "It was a strange race. I expected it to be more attacking." Britain's Ben Swift finished 12th, seven seconds adrift of Kwiatkowski. A terrific ride from the Yorkshireman. What a stunning finish by Kwiatkowski. He was the first to make a big move on the final lap and he has been handsomely rewarded. Australia's Simon Gerrans was second with Alejandro Valverde of Spain finishing third for a third consecutive year. Kwiatkowski is head down, pedalling for all he is worth. Gilbert leading the chase, flicks his elbow, he wants some help but nobody is coming through. He has Van Avermaert in his wheel though. Here we come into the final 300m, is anybody catching him? Gilbert is throwing caution to the win on the descent. Valverde is leading the chase but there is just 1.5km to go and the chasing group are seven seconds back. "Spain have got the numbers but have they got the distance to bring back Poland's Michal Kwiatkowski? We know he has the time-trialing technical ability." Kwiatkowski is out on his own on the descent into Ponferrada. Just 3km from the finish. He keeps glancing over his shoulder. "Don't look back," says Hayles on commentary. Kwiatkowski bridges over to the four out front, spends a few seconds recharging his battery before going again on the lower slope of Mirador. Can anyone follow him? He has just 5km to go. Spain's Joaquim Rodriguez is the first to react. He is followed by a Belgian... it's Gilbert. Australia's Gerrans is there. Has Ben Swift got anything left? He is in the chasing bunch but is 25 seconds down. Race over for Ben. The four out front drift left, right, left, right, left down Confederacion, swing right over the dam and head to the bottom of Mirador. Kwiatkowski of Poland makes his move. He knows he doesn't have the legs to beat the likes of Kristoff or Swift in a sprint. He needs to repay the work done by his Polish team-mates earlier in the race when they rode on the front in chase of the early breakaway group. "It's all or nothing now for the Belgium squad. They are all up at the front but who are they working for? "If it does come down to a sprint you have to think it is Tom Boonen. But the final climb is a perfect launch pad for Philippe Gilbert." The riders are approaching the top of Confederacion. There is the descent, a 1km climb of Mirador and then it's just 4km to the finish of the 2014 road race at the World Championships. The leading quartet are now just nine seconds clear of the chasing pack. Britain's Ben Swift is all alone, in terms of team-mates left to help him. He is about 10 from the front and riding in the shelter of the peloton. He is riding a fantastic race and regardless of where he finishes now, it has been a terrific effort from the 26-year-old Yorkshireman. "Alejandro Valverde is in the form to do it and he likes the course. He was second in the national championships on this course. "Cancellara is there. Boonen is there. Spain looking strong. Italy looking strong and Belgium too. "I don't think Swift has got anybody left with him to help but he looks good." The four out front, Italy's Alessandro De Marchi, Cyril Gautier of France, Denmark's Michael Anderson and Vasil Kiryienka of Belarus are just 15 seconds clear as they toil up the 5km ascent to Confederacion. We have 10km remaining. Spain's Jonathan Castroviejo, mouth agape, is leading the peloton. He has three Italians for company while Germany's John Degenkolb is gritting his teeth half a dozen wheels back. Degenkolb won four stages at the Vuelta a Espana earlier this month but had a spell in hospital after getting an infection, putting his participation in this race in doubt. Nibali is back in the mix. The Italian was reported as being dropped but he is made of hard stuff and is racing with team-mate Sonny Colbrelli in his wheel. South Africa's Daryl Impey is another who is well placed and may fancy this finish. It really is wide open. Ben Swift is still up near the front, riding alongside Nibali. Just 13km remaining and the peloton is closing quickly on those out front. The gap is down to 20 seconds. "This is the final time they will do the small climb at the castle. Then there is a right before the long drag and the leaders will need more than 40 seconds to be out of sight of the peloton. "We have seen in the Under 23 race going clear and winning it, but other than that it has been group finishes." Peter Sagan was in the main bunch over the start-finish line. With only two Slovakian team-mates in the race he has ridden an anonymous race. Will he light it up on the final ascent of Mirador? Expect fireworks because there are riders who will not want to get involved in a sprint finish. Switzerland's Albasini is leading the peloton, riding for Fabian Cancellara. They are 35 seconds behind the quartet out front as they hit the bottom of the climb to Confederacion for the final time. Belgium's Sep Vanmarcke leads a huge group of more than 50 riders over the line, just 36 seconds down. This is set up for an almighty scrap on the final lap. Can the four out front stay away? Will Ben live up to his name and give Britain a third world champion? We'll know in about 20 minutes. Rob Hayles also mentions Alexander Kristoff as a potential winner. The Norwegian won this year's Milan-San Remo one-day race that Ben Swift finished third in. He excels in the wet. Kiryienka, the Team Sky rider, makes the trio out front a quartet as they power down the start-finish line and take the bell. Just 18.2km remaining. "There are still an awful lot of riders in this and a lot who can win it. All the main players are still there and all with team-mates. This is going to be so interesting." Four Belgian riders have positioned themselves at the front of the peloton as they reach the bottom of the climb to Mirador. Just 1km long but with gradients of 10% to sap the legs further. Anderson lead s out escaped trio over the top, Vasil Kiryienka of Belarus is just eight seconds back on his own. Albasini of Switzerland leads the peloton, which is 32 seconds adrift. Quick shot of Ben Swift who is a few seconds further back but looking remarkably fresh to say he's been racing for six hours. Swift has Cancellara in his wheel. One by one the pre-race favourites are starting to drop away. Perhaps the race winner could come from a name I'm yet to mention. Defending champion Rui Costa had a quiet race last year before coming to the fore late on. Denmark's Michael Andersen is the other rider in the break as they reach the upper slopes of Confederacion. They have just 26km to go. Tour de France winner Vincenzo Nibali has been dropped by the peloton. No huge surprise, given the Italian crashed earlier in the race, aggravating a hip injury he sustained in a crash a couple of weeks ago. "It's all starting to light up in the peloton with riders trying to get off the front. "They are really stringing it out and the gaps are starting to open up. "Spain are extremely well represented at the moment." And as soon as that break is closed down, another one goes. Riders are starting to be spat out the back of the peloton. As I said earlier, the two climbs on each lap are not that tough, but when you're riding over them for the 13th time, the legs will start to burn. Italy's Alessandro De Marchi is in a three-man attempt. France's Cyril Gautier, a renowned breakaway schemer, is also there, with a Danish rider. Pete Kennaugh sets off in pursuit of Visconti and easily catches the Italian as they ride through the feed zone. Kennaugh rejects a bottle, grits his teeth and stomps a little harder on his pedals. The duo are dangling a handful of seconds clear of the peloton, which as caught the other escapees and Kennaugh gives one last glance over shoulder before giving up and settling back into the peloton. Adam and Simon in the coming years. "Around 50% of the peloton are out of the race. "Visconti has decided he is not waiting around. Earlier, he was trying to get some impetus into the group and he is not happy so he has gone. "He will like this finish, but not with a group. The descent and the launch pad just before suits him." 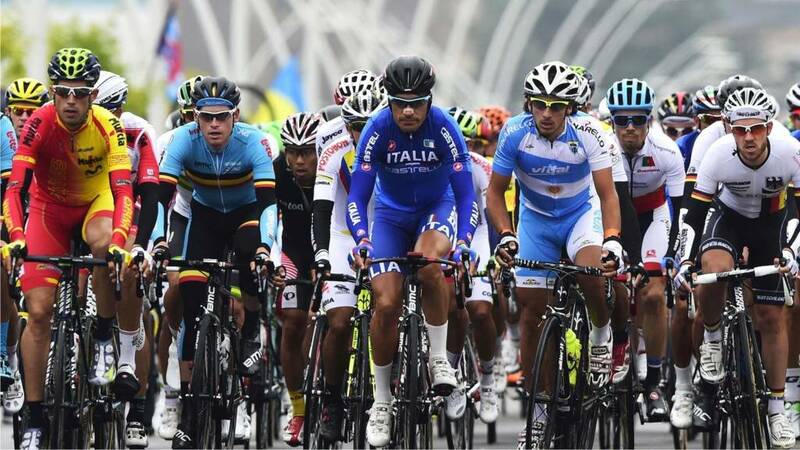 Italy's Giovanni Visconti has got fed up of waiting and taken off on his own from the breakaway group. He hasn't got the pace to challenge anyone in a sprint finish so needs to solo to the finish. He sweeps left, up past the castle and onto the climb to Confederacion for the penultimate time. His lead is just four seconds though and the peloton is closing in, just 20 seconds back. Britain's Pete Kennaugh leads the break over the start-finish line in Ponferrada. The rain has abated but the road is still damp as the Isle of Man rider leads the 11 out front (Belgium's Tim Wellens has been dropped) round a succession of right-angled corners in the town. Luke Rowe and Ben Swift cross the line near the front of the peloton in the perfect place to monitor attacks. "A lot of the riders are saying the circuit isn't as tough as they thought it would be before they came here and rode it. Up until now we have seen that the sprinters have been able to manage. "But that last climb, were they brought Martin back, that is the launch pad and where riders like that really suffer. They need a team-mate to follow a wheel." A cry of "Espana, Espana" from the crowd packed on the roadside of the climb to Mirador reminds me we are in Spain and that I've not really talked about any of their riders. Alejandro Valverde has been on the podium five times - two seconds and three thirds (two of them in the last two years) - can he get on the top step? Joaquim Rodriguez finished second last year and is also a potential winner. In answer to Rob's question, Martin has little in his legs as he is caught by Kennaugh's group on the ascent to Mirador. Norway's Edvald Boasson Hagen takes up the pace on the descent. The peloton crests the summit 42 seconds later. As predicted by Geraint Thomas pre-race, Luke Rowe is looking after Ben Swift. All very much going to plan for Britain at the moment and with Kennaugh in the front bunch, the British riders do not have to chase to bring back the break. They can reserve their energy for the final lap. "This next couple of kilometres will be interesting to see. When the road kicks up on the second climb is when we will see what Tony Martin has left in his legs. "Australia will ride the tempo on the front of the peloton and hope to hold it together so nobody can go off the front." Nerves of steel from Tony Martin as he descends from Confederacion at speeds approaching 70km/h. In the wet. Pete Kennaugh's group of 11 are following, 15 seconds adrift, with the peloton tackling the descent slightly more cautiously. Just 42km remaining for Martin, who is on the 1km climb to Mirador, which has gradients of 10% in places. Australia have a couple of cards to play with Simon Gerrans and Michael Matthew potential winners. They also have 2009 world champion Cadel Evans in their nine-strong squad. Evans, the 37-year-old who won the 2011 Tour de France, has recently announced his retirement. He probably won't be in the final shake-up but his experience on the road could be invaluable. Britain have a similarly experienced road captain in David Millar, who is riding in his final race for the national squad. "The Aussies have come into this with such a strong team and that is what has made the race so interesting as there are so many teams with riders who could win. "It's so difficult to make a pick, it's like picking your lottery ticket." Tony Martin is on the 5km climb to Confederacion. He is a time trial specialist and has settled into a decent rhythm and is maintaining a lead of 25 seconds over the chasing bunch of about a dozen riders, which still contains Pete Kennaugh. News reaching me that British duo Chris Froome and Adam Yates have dropped out of the race. As with Geraint Thomas, it's not always about getting to the finish, it's about supporting your protected rider and hoping he can make it over the line first. Britain are riding for Ben Swift. Peter Sagan has not been seen so far. Presumably sheltering in the peloton, waiting for the right moment to attack. Sagan's problem is that he will be a marked man and he has struggled this year to get his tactics right. He was looking good on the second stage of the Tour de France in Yorkshire in July but went too early on the descent into Sheffield and was caught. John Pierrepont: Looks like the sprinters are marking each other, where's Sagan? Almair: I think it will come down to a reduced sprint at the finish. Can't look past Simon Gerrans and maybe Greg Van Avermaet. Martin is 20 seconds clear of the bunch that contains Pete Kennaugh. The peloton, which is now being led by the Australian team, wary that their man Simon Gerrans missed the break, is 30 seconds behind the leader. The rain continues to fall as the riders head through the middle of Ponferrada and out towards the castle (pictured from earlier in the race). "In 20th position just going through the last checkpoint, Ben Swift was on the wheel of his team-mate Luke Rowe and John Degenkolb is there for Germany. So the sprinters are still there and we will expect them to come through later." Germany's Tony Martin has gone off on the attack as the road flattens out on the way back to the start-finish line in Ponferrada. Martin, a three-time time trial world champion, was beaten by Britain's Sir Bradley Wiggins on Wednesday in that discipline. Is this a reaction to losing his title? Or a clever move designed to put pressure on those out front, knowing he has team-mate John Degenkolb in the chasing bunch? This is an interesting move with some high-quality riders in it. Norway's Edvald Boassan Hagen, a Team Sky team-mate of Kennaugh for a couple more months before he leaves to join MTN Quebeka, is in there. He was second in 2012. Belgium are represented by Tim Wellens and Sep Vanmarcke. Giovanni Visconti and Giampaolo Caruso are the Italians in the leading bunch with Simon Geschke of Germany. The group is growing and they are 22 seconds clear of the peloton as they go over the top of Mirador and head off downhill through the spray. The quartet who were leading have been caught on the climb of Confederacion. Kennaugh is leading the race down the descent. The riders are feathering their brakes as they tip-toe round the snaking lefts and rights before almost coming to a standstill as they take a 90 degree right-hander to go over a dam. Nobody wants to crash at this stage with just 60km remaining. "There are riders who don't mind the weather. But there are other riders that as soon it starts to rain their heads really do fall off. But for most of the favourites they will be there or there about. "The rain does change the way the peloton reacts on the road. If you can get a break and get a couple of seconds advantage going into a technical finish it can really affect the chase." A group of seven riders, including Britain's Peter Kennaugh, have broken clear of the peloton. It doesn't look like it's going to be a decisive break but a couple of Spanish riders race over to make sure they have a presence. There are a couple of Belgian riders in there. Kennaugh glances over his shoulder and sees there is no other British rider in the break and decides to push on. On Ben Swift: "Milan-San Remo was a great ride to get himself on the podium. He has had three or four wins this season, but he has been on the podium an awful lot. "He has got the team behind him and that makes a difference at the World Championships. He knows everyone is here for him and that really does make a difference." British hope Ben Swift told BBC Sport before the race: "We have got nine strong riders; strong for the climbs and for positioning. If it does come down to a sprint, I will be there. "To win it would be amazing. It would be career and life changing. It's an iconic jersey." told me himself before the race that there was high percentage chance that he would not make the finish. His main role was to look after Ben Swift and he would probably only last 150-200km. Job done Geraint - it's over to Luke Rowe to keep Swift company for the next 40km or so. Other riders to keep an eye out in the final 70km...Australia's Simon Gerrans won Liege-Bastogne-Liege in the spring and this route looks tailor-made for him. He can get over climbs and can sprint with the best. The Belgians have several riders who could be in the picture. Philippe Gilbert, who the 2012 title on a similarly hilly course, is an obvious one to look at. They also have Tom Boonen, Greg Van Avermaet and Sep Vanmarcke who may fancy their chances. With so many potential winners though, could that go against them? The 4km ride from Mirador to the finish line in Ponferrada is largely downhill, which is why Rob Hayles on commentary says position is vital, particularly with rain starting to fall again. It is essential to be near the front of the race because wet descents are treacherous descents and you want to minimise the risks of being caught behind a crash. The Italian-led peloton is just over two minutes behind the escapees as they cross the start-finish line. "Position is key on the climbs. There is an awful lot of climbing - just over 4000 metres. It's not steep, just relentless, as they just keep coming. "You can see the work being done at the front by the Italian team and we are seeing riders heading out of the back of the peloton for the first time. All the big hitters are up here." British riders Pete Kennaugh and Luke Rowe are in the leading dozen or so riders in the peloton as they crest Mirador just two minutes, 57 seconds behind the quartet out front. British rider Chris Froome: "It was amazing to be part of the 2011 World Championships in Copenhagen with Mark Cavendish winning it, it was great. It would be amazing to do the same with Ben Swift. "It is a different experience [not being the team leader] but one I enjoy - not necessarily having pressure on my shoulders, but to give something back to the guys." The rain is beginning to fall again as the leaders reach the summit at Mirador. They are just three minutes, 55 seconds clear of the chasing peloton, which is now led by the Italians. Tour de France winner Vincenzo Nibali was expected to be their main rider but he crashed on lap five, landing on the same hip he injured in a race a couple of weeks ago. I wonder if their strategy may be changing? one-day Spring Classics, which are regarded as the toughest single-day races on the calendar. He only has two fellow Swiss riders in his team though, which may hinder him. Most of the other favourites have nine-strong squads, which means they can be offered more support. The leading quartet are just 83.5km from the finish but they are looking extremely weary as they toil up the road to Confederacion. They have been out front for more than four hours but their lead is disappearing quickly. Lithuania's Zydrunas Savickas, Croatia's Matija Kvasina, Carlos Quintero of Colombia and Oleksandr Polivoda of Ukraine are now just five minutes clear of the chasing pack. A little bid of sad news to bring you - the Norwegian team car crashed on the course a little earlier today with early reports suggesting the team boss sustained a broken leg. The Norwegians were sharing the car with Croatia and their team manager sustained a broken arm, leg and hip. Hopefully there were no other injuries and we will bring you more news as we get it. The Poles are presumably riding for Michal Kwiatkowski. He likes the one-day races and was third at both Spring Classic races La Fleche Wallonne and Liege-Bastogne-Liege earlier this year. You may also recall he won stage four of the Tour of Britain. The Polish riders are continuing to drag the peloton along as they come over the start-finish line for the 10th time. Just five 18.2km laps to go. The British riders are all in the leading bunch as they zip over the line five minutes, 47 seconds adrift of the leading quartet. British Cycling: Great Britain are playing a smart game at the moment, sheltering in the wheels. Very different from Copenhagen in 2011. The sun is trying its best to peak out from between the heavy clouds hanging over the course in northern Spain. Torrential rain early on made the descents from both climbs extremely treacherous in the opening half dozen laps. The roads have been drying out over the last couple of hours but there are a few spots of rain appearing on the cameras following the race, which could make the final run-in very interesting. So, who is going to emerge victorious? I want to hear your thoughts. Are Britain right to get behind Ben Swift? Can he become just the third British winner, after Tommy Simpson in 1965 and Mark Cavendish in 2011? BBC Sport website column. How about some of the other one-day classics specialists such Belgium's Philippe Gilbert, Switzerland's Fabian Cancellara or Peter Sagan of Slovakia? None of the pre-race favourites have shown their faces yet - I'll be taking a closer look at some of them as the race progresses. They will be saving their energy for the final couple of laps when the race is expected to liven up. At the moment, the Polish team is dictating the pace of the peloton, and has been doing so for the last three or four laps, which all the other teams will be absolutely loving, given they are not having to work so hard. Four men made a break on the first lap and they have been out front all morning. The quartet are Lithuania's Zydrunas Savickas, Croatia's Matija Kvasina, Carlos Quintero of Colombia and Oleksandr Polivoda of Ukraine. They were allowed to open up a lead of around 15 minutes, 30 seconds at one point but that advantage has been cut to eight minutes midway through lap nine. The 254.8km (158.33 miles) race, is made up of 14 laps of 18.2km. Each lap features two climbs - the first to Confederacion is about 5km in length and has an average gradient of 3.3% but sections of around 8%. The second to Mirador is a shorter, sharper ascent of around 1km, with an average of 5.5% and sections at 10%. The summit comes just 4km from the finish in Ponferrada. The hills on their own are not particularly challenging but over 14 laps they add up to more than 4,000m of ascending which is similar to the big mountain stages on races like the Tour de France. Hello and welcome to live text commentary of the final 100km of the men's road race at the World Championships in Ponferrada, Spain. The race began at 09:00 BST and is expected to finish around 16:15 BST. You can also watch the race on BBC Two from 13:20 BST or by clicking on the play button or via the Live Coverage tab at the top of this page. British Cycling: The British team were in relaxed mood this morning before the start of the race. Geraint Thomas said in his BBC Sport column: "I'll be staying with Ben Swift, to help him as his domestique. If he needs anything - like a bottle, food, raincoat, or new wheel after a puncture - I'll be helping him out. There is a high percentage chance that I will not finish the race. For me, it will all be about the first 150-200km. It's all part of trying to get a British winner of the race."